Home/People and Sound/Investigate Marine Animals/How is active acoustics used in fisheries research and management? Acoustic surveys are used in the monitoring and management of many fish species, including herrings, anchovies, sardines, Atlantic cod, and walleye pollock. Fisheries scientists use active acoustics to estimate fish biomass and abundance (stock assessment); evaluate spatial and temporal distributions; and measure size distributions and population structure. In addition, these methods can also be used to characterize habitats and study behaviors such as migration, spawning, feeding, and schooling. Active acoustic methods allow researchers to sample larger volumes of water than by towed net sampling and to access areas or species that are otherwise difficult to survey (e.g. deep water, rugged bathymetry, or fast-moving fishes that avoid nets). A high resolution ologyhosounder image of zooplankton and fish schools. Dense fish schools are shown as bright red and yellow clumps near the surface. Below these schools are a layer of zooplankton (thick green layer). Deeper still are additional small, dense schools of fish (smaller circles with yellow and green). The seabed is shown as the red, sloping line along the bottom of the frame. Image courtesy of Anthony Hawkins. 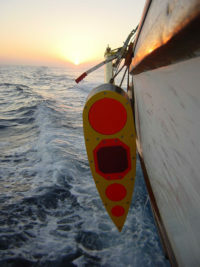 Scientific echosounders operate similarly to commercially available “fish finders” by producing a brief, focused pulse of sound and listening for echoes. When the sound encounters objects that are of different acoustic impedance than the surrounding water, such as fish or the seafloor, some of the sound energy is reflected back to the transducer and translated into a digital output on a monitor (echogram). An echogram can include images of both single objects and groups of objects. Target strength is a measure of how much a fish, plankton, or other object in the water column scatters sound towards a transducer. In general, larger animals have larger target strengths, although other factors, such as the presence or absence of a gas-filled swim bladder in fishes, its size and shape, and a fish’s orientation and activity in the water column, also have an impact. Several acoustic frequencies are often used at the same time, allowing for the discrimination of different types of marine organisms and ocean layers. When individual targets are spaced far enough apart, the number of fish can be estimated by counting the number of individual targets. This is called echo-counting and is the historical way to estimate fisheries biomass. Oftentimes, however, it is not possible to resolve individual targets (e.g., schooling fish or plankton layers), and the echosounder is measuring the volume backscattering strength of the entire school. Echo-integration uses the total backscattered acoustic energy, divided by a previously determined volume backscattering coefficient. This overall calculation is used to estimate biomass. Ground truthing acoustic data via fish trawls, video feeds from baited cameras, or looking to already-published data helps scientists validate acoustic estimates. Problems in assessing fish abundance can arise from changes in the behavior of the fish. For example, lower levels of scattering coefficient were measured from a sprat population during the day, when the fish were aggregated into schools, than at night, when the fish were distributed throughout the water column. The difference in scattering led to large differences in acoustic abundance estimates for daytime and night-time, with more than a doubling of the estimate at night. A pole-mounted multi-frequency echosounder array being lowered into the ocean for use. Image credit: NOAA Fisheries, Southwest Fisheries . 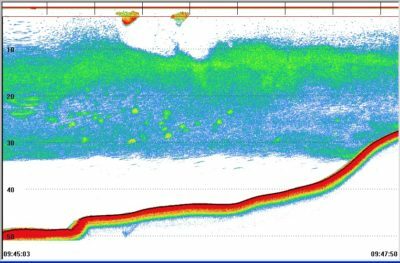 Echosounders have progressed from single-beam systems developed after World War II to the multi-frequency, multibeam systems in use today. Split-beam echosounders, operating in a frequency range of 12 to 200 kHz, are the standard equipment for hydroacoustic fisheries assessments. Split-beam echosounders receive echoes in four quadrants on the transducer face, allowing the position of the target or the depth and range of a layer to be determined in three dimensions. Split-beam echosounders can sample to water depths of 100 m to greater than 500 m. Multibeam echosounders, originally developed for mapping the seafloor, project a fan of narrow sound beams outward into the water and record echoes in each beam. This system covers a wide swath at high resolution; in some cases entire fish or zooplankton schools, can be ensonified in detail. Broadband systems, which operate at a wider frequency band than traditional echosounders, allow for size classification of mixed assemblages of fish, something very important for diverse environments such as coral reefs. Most echosounders are mounted on a ship’s hull. Transducers can also be deployed on a pole mount, or towed behind or alongside a vessel (e.g. “towfish”). Towed bodies are particularly useful for studies of deep-living species, which typically live below the range of an echosounder at the surface. Instruments can also be deployed on or towed behind remotely operated vehicles (ROVs), autonomous underwater vehicles (AUVs, such as gliders), and unmanned surface vessels (USVs). Fisheries assessments can also use transducers in fixed locations to provide continuous, high-resolution acoustic data to identify and count fish. Upward facing, split-beam echosounders are often used to quantify fish passage at hydroelectric dams. They can also be used to characterize schooling behavior in fish and investigate variability in schooling dynamics. Acoustic cameras use higher frequencies and multiple beams to create high resolution, three-dimensional digital images of the water column. However, the higher frequencies used by these systems also limits their range. Fisheries acoustics continues to evolve and support a range of research and monitoring objectives. The availability of new digital hardware and combination of experimental measures with modeling have enabled new approaches to stock assessments. The integration of acoustic fisheries measurements with oceanographic data is also important to advancing ecosystem-based fisheries management. People and Sound, How is passive acoustics used to study fish distributions? People and Sound, How is sound used to find fish? People and Sound, How is sound used to identify fish?